The ignition coil is one of the most important parts of an engine. They are responsible for providing the energy necessary to burn the fuel as it enters the engine cylinders. A bad or failing ignition coil will play havoc with the engine timing and will eventually leave you broken down on the side of the road. Early symptoms of a failing ignition coil include engine misfires, a jumpy ride and decreased power especially at higher speeds. How Does An Ignition Coil Work? The Ignition Coil (also known as Spark Coil) is the heart of the ignition system. It's job is to transform the battery voltage (12V) into the thousands of volts necessary to initiate the ignition on the spark plug. In other words, the ignition coil is in charge of providing the energy required by spark plugs. A weak coil will not be able to accomplish its mission, having as a possible consequence, a “no spark” condition. But how you can tell if an ignition coil is weak? Several factors determine the amount of energy required to create the electric arc in the spark plug. Some of them are the engine compression, air-fuel ratio, combustion chamber temperature, spark plug materials, spark plug calibration (aperture), etc. Over the years, vehicle manufacturers have focused on developing more efficient engines. That implies engines with higher levels of compression and leaner fuel delivery. These changes demanded more and more energy from the ignition system. As a consequence, single coil engines became obsolete opening the way to multi-coil systems. Nowadays, the most common multi-coil system is known as Coil-On-Plug (COP). This particular design consists of one ignition coil per cylinder. Each coil is directly attached to the spark plug, which contributes eliminating electrical loses from spark plug wires. Unless stated otherwise, this article will assume that your vehicle is using a COP system. Due to its crucial role in the ignition system expect the CEL lit after few driving cycles with a damaged ignition coil. Without proper spark energy the combustion process will not be efficient and a noticeable decrease in fuel economy will be evident. It's worth noting that poor fuel economy can also be caused by a failing MAF sensor or dirty engine filters such as the fuel filter. Depending on the vehicle year and maker the ECU may not compensate for this failure during idle. This might cause a rough idle or even an engine dying occasionally while idling. Depending on the number of defective coils you may experience difficulty during engine start. A difficult to start engine can also be caused by other problems with the electrical system such as a flat battery, so it's worth ruling these out too. Ignition energy degradation will cause engine misfires that will affect overall performance. Having one or more faulty COP will cause a severe lack of power in the engine, especially during acceleration. 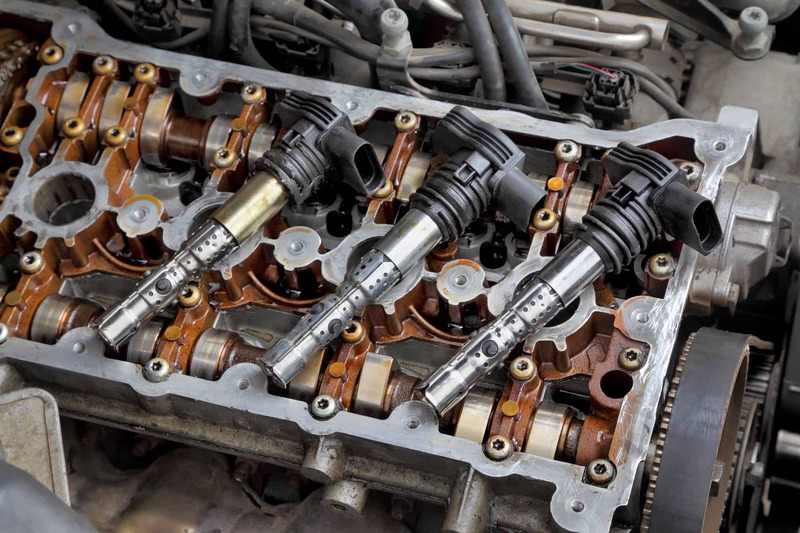 This can also be caused by bad injectors, so it's worth looking at these too. Fuel particles won’t burn in the combustion chamber as they usually do and will enter the exhaust pipe with a high energy charge. That energy will be unleashed in the form of mini explosions. A bad ignition coil will increase emissions, particularly Hydrocarbon emissions, which could be a problem if you live in an area with smog checks. The failure to burn the fuel in the combustion chamber will cause a noticeable gas smell coming from your exhaust pipe. Basically, an ignition coil is a transformer. As any transformer, it has a primary winding and a secondary winding. It receives battery voltage on the primary winding and when the current is disrupted the magnetic field collapses causing a huge voltage output on the secondary winding. Modern ignition coils have output voltages in excess of 45,000 volts, able to ignite the ultra-lean mixture of fuel injection systems. Unlike traditional single-coil ignition systems, on current COP systems, the Electronic Control Unit is in charge of activating each individual coil when it's needed. Most COP electrical connectors consist of three wires: one for ground, one for battery voltage and one for ECU activating signal. It’s not uncommon that all three wires connect directly with the ECU because many designs incorporate current and/or ground monitoring for each coil. Inductive type ignition analyzer (inductive pickup tool). > Data trouble codes: using an OBD2 code reader take note of any DTC present in the ECU memory. For doing so you only need to connect your code reader and turn the ignition key on (engine off), a state usually known as KOEO. > Data trouble codes clear: now that you know what codes were stored into memory you need to clear them. This is usually done selecting “clear codes” in your tool. > Driving cycle: disconnect your OBD2 code reader and start the engine, this state is commonly known as KOER (Key On Engine Running). If the Check Engine Light turns on then stop the engine and continue with the diagnostic. If the Check Engine Light remains off then drive the vehicle for 5 to 10 minutes. If the light remains off you may have an intermittent problem. If the light lit during your driving cycle then continue with the diagnostic process. > Coil wiring: perform a meticulous visual inspection of each coil wiring. Look for burnt, damaged, corroded or deteriorated wires. Pay special attention to possible shorts to ground or open circuits produced by a faulty insulation. > Coil harness and connector: similar than before, perform an exhaustive visual inspection of each coil connector. Ensure that the ignition key is switched off and unplug each coil harness connector. Look for bent terminal pins, loosely connections, corrosion or any other possible indication of a bad connection. > Coil condition: in order to check the coil condition you’ll need to remove each coil from the engine. Refer to the last section if you have any doubt about the procedure. Perform a meticulous visual inspection of each coil. Look for burnt, damaged, cracked, corroded or deteriorated coil boot, spark wire or coil housing. Pay special attention to any sign of water, oil or moisture. Any liquid in contact with the coil will damage it very quickly. Repair as necessary. > Supply voltage: refer to the proper wiring diagram and identify the terminal corresponding to the +12V line. In order to measure the supply voltage, you will need to enter in KOEO mode (Key On Engine Off) and turn the digital multimeter dial to “voltage” test mode. Now place one multimeter probe in a known ground (battery negative is a good one) and the other probe tip in the terminal of the coil wiring harness corresponding to the +12V supply. If the measured value is below 95% of the battery voltage then you will need to check the entire line from the coil harness all the way to the ECU itself. > Ground test: enter in KOEO mode (Key On Engine Off) turn the digital multimeter dial to “voltage” test mode and place one probe tip on the coil harness terminal corresponding to the supply voltage and the other on the terminal that should be the ground. Ideally, the voltage would be the same value as the previous test, if the difference is greater than 10% then you will need to check electrical resistance and continuity of the ground line from the coil harness all the way down to the ECU. Recommended tools: automotive scan tool with live data capabilities. > Cylinder Misfire live test: using an automotive diagnostic scanner you can indirectly diagnose faulty coils. Enter in live data mode and look for cylinder misfire values. Most modern engines discriminate the misfires for each cylinder. Ideally, no cylinder should report misfire problems. 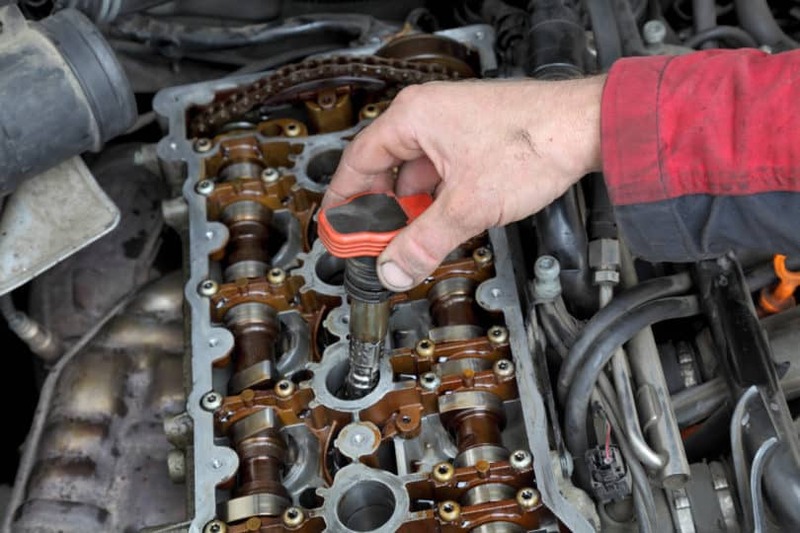 If a particular cylinder has a high misfire count you can suspect from fuel injection, spark plug or ignition coil as the most probable causes. > Coil On Plug functional test: some manufacturers include special tests or functional tests for the ignition coils. Follow on-screen instructions to complete those tests. Recommended tools: Inductive type ignition analyzer. > Coil live test: using an Inductive type ignition analyzer you can test the coil activation in real time. Depending on the model of your tester you may check ignition coil activation, spark plug duration time, coil output voltage, and even graphing the ignition coil pattern. The great advantage of this tool is that you only need to “touch” the coil that you want to test. It uses inductive technology (the same electrical principle that drives the ignition coil) so is the most practical way to test COP systems quickly and accurately. Coils part of COP systems are usually located above each spark plug on the valve cover. > Preliminary steps: ensure that the ignition switch is off and then disconnect the vehicle battery. Detaching the negative terminal is usually enough. > Remove coil connector: this step may be tricky in some models. Generally speaking, the connector has a plastic tab that you should push down while you pull out the harness. But in many cases, there is a small security clip (sometimes plastic, sometimes metallic) that must be removed first using an adequate screwdriver. > Remove coil: most COP systems use a plastic cover to protect the coils. Lift the cover and use the appropriate tool to remove the coil. You will find it an easy task since usually, coils are attached with two bolts. > Install the new coil: retire the old coil and then install the new one. Double check that you’re using the adequate part number. > Reconnect the coil and battery: once you are done, reconnect the coil (don’t forget security clips) and then the battery terminal. > Clear DTC memory: using the OBD2 code reader clear the ECU memory to prevent any false code been stored. You will need entering in KOEO mode for doing so. > Perform driving cycle: once you are done, drive the vehicle for more than 10 minutes. Try to accelerate as you would normally do.